Hi. Hope you are having a great time. I cannot put in words how much I am excited to teach you everything I know about basic electronics. I want to teach you everything, but it is not possible to write it all down in this single post specially for you, beginner people, coming here to learn basics of electronics. Here is the deal, I am confident you will learn at least about the basic tools and basic components to get you started with your learning journey of electronics. You will learn a lot but this is the least minimum threshold. Apart from this minimum threshold, I try my knowledge best to cover the following main objectives in this whole lecture. I will be happy if you understand it all and give it try. Learning and playing with electronics tools is so much fun. What actually learning basic electronics mean? Know about the basic electronics components, their electrical symbols, and how they physically look. Try to identify almost every electronics component on circuit board. Know about various measuring tools. Know about the multimeter and oscilloscope. How to measure resistance and voltage with multimeter. Know about important simulation softwares frequently used for designing any electronics circuit. Know a little about Arduino broads. Don’t get scared. I know, some terms are scary. But actually they are not. So, lets try to unfolded these scary terms, and have fun learning electronics. And by the way, I also offer private coaching class about leaning electronics. You are interested in electronics and want someone to teach you. I am available to happily teach you. 1 What is basic electronics? 2 A little motivation, why to learn basic electronics? A lot people have different opinions on this topic. For someone, it is making basics circuits. While for others, it is fundamental knowledge for learning electronics. All are true in their opinions. But in my opinion, it is the knowledge using which you can design or troubleshoot basic projects to solve a problem. It is the knowledge you learn to actually design a solution for small problems, or just having fun playing with electronics components and exploring new things every day. let take it to a little advanced level. If you don’t get it. It is completely fine. You will get as you go with the lecture. Basic electronics is learning about basic electronics components, learning how to arrange these components to make a circuit. Well, you just can’t assemble these components in any random arrangement to make a circuit. You will make mistakes and sometime these mistakes can harm you. To handle these mistakes, there are simulation softwares. Basics electronics is learning about these simulation softwares, making your circuits on it. Once you finalize your circuit in a simulation software and done with all your mistakes. It is time to actually test it practically. 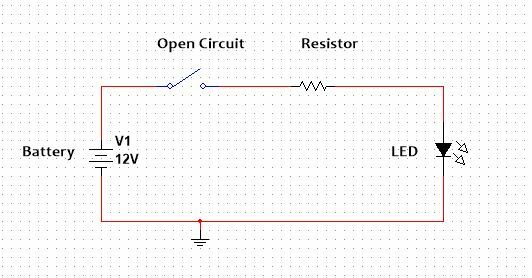 Basic electronics is learning how to make a circuit practically on breadboard or on PCB board. What I am saying basic electronics is a subset of huge electronics, but it is not limited to learning simple concepts. In my opinion, it is the first step, it is just doing small electronics in a fun yet professional way to solve your small problems. A little motivation, why to learn basic electronics? Well, I don’t think there is a need for this section. I know you love it thats why you are here. But I have something which you might not know at this time. It is a perfect hobby which you can turn into a profitable career. People start learning electronics as a hobby and find it so much fun that it becomes the source of their income. There are a lot of opportunities out there for electronics people. You can start a career as a freelancer, like me, and enjoy work in the comfort of your own zone. It is fun making a security system for your room, controlling your room’s lights with your phone, flying a drone in the air and watching videos live from a flying drone. It is fun to have basic knowledge of how big things works. It is fun to have own small electronics lab and spending your time playing around with a multimeter, oscilloscope or function generator. Beside fun you can use this knowledge to repair your home equipments or try to troubleshoot your home for electrical problems. You can also use this knowledge to diagnose your car. Enough talk, let get into real learning. The first thing I want to start with is, learning about the multimeter. It is the first tool, I have for you. Just like doctor having their stethoscope all the time, multimeter is the tool you will have all the time. Difference is, you can’t use it on patients. It is a measuring device, used to measure the following quantities. I know, you don’t know anything about the said quantities. But you well. The reason I started with this tool is, we will need it measure the mentioned quantities in their respective topic. And I don’t want you to get confused there, when I talk about this guy. The other reason is, it feels great to have multimeter. When you have multimeter in hands, you will try to learn about it and eventually end in learning the the said quantities. Also you will feel like, yeah I have a multimeter, I am an electronics person. need to measure something with it. And this is how you learn basics of electronics. Now, you have a little idea of this awesome tool. Lets try to learn a little about it. There are two types of multimeter. One is called an auto range multimeter, and the other is called manual range multimeter. Difference is, auto range multimeter automatically sets its measuring range while in the later one you have to set the range yourself. Basically, the auto range multimeter is awesome and very smart than the other one. Never buy the manual range one unless you are too broke. 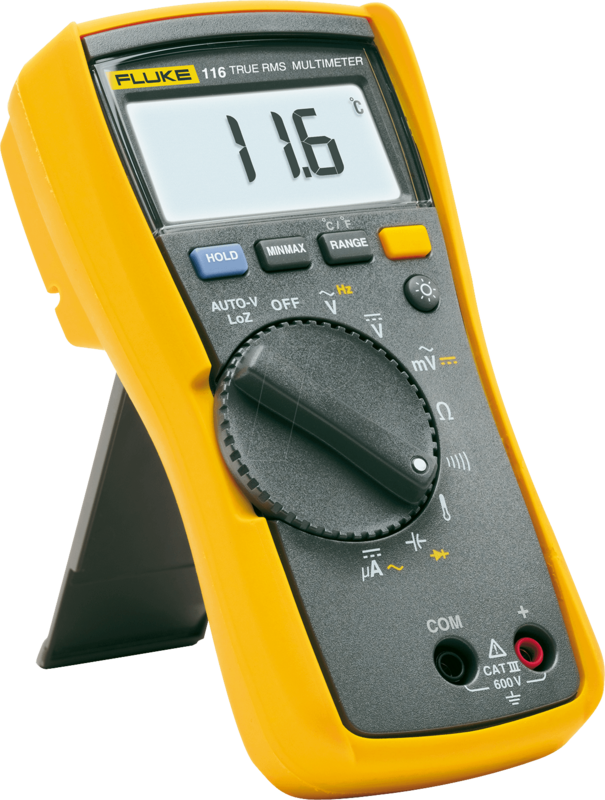 In every multimeter there is dial or nobe, using which you set the range. For example, you want to measure the voltage. All you need, in case of auto range multimeter, to set the dial to the symbol of V.
With this we learned how to use a multimeter to measure voltage. Isn’t too simple to learn electronics? A little fun activity. Follow the following exact steps and tell me in comments section what you learned and share your results. Take a multimeter and a battery cell. Set the multimeter to symbol of V.
Place the probes of multimeter across the cell. Note the readings on the screen of your meter. Want to fully understand this activity, head over to my post, how to measure voltage with multimeter. Don’t go their right now. Go their when you have your multimeter and battery cell. Right now, lets go further with the present lecture. I think you got the idea of multimeter, now lets talk about the basics components and try to use multimeter to play with these components. Every electronics circuit is made of basic electronics components. The combination of these components determines the behavior and purpose of a circuit. Same resistors, diodes, and capacitors connected in some way may make a power supply circuit. But the same components with different arrangements may end in a whole different circuit. Following are the brief introductions to these basic components. I have decided to make a separate blog on each component. For some, I have already done and some are under process. I will keep updating this post as we progress together. It is the first component you will encounter in learning electronics. I remember it was my first day in engineering university, the first lab was to learn about the measuring resistance using a multimeter. This is how I was introduced to the resistor. If this is the first you are introducing to resistor through this post. Well, you can buy me a Ferrari then. Just kidding! Electricity is the flow of current through conductor or semiconductor. You can imagine electricity as the flow of water through a pipe. The wider the pipe the more water can easily flow through it. Same goes for electricity, the wider the conductor, the more it has free electrons, the more current flows through it. But sometimes we want to control this flow of current. We want a specific amount of current to flow through the devices. And this is done by using a resistor. A resistor is rated in terms of resistance (R), the ability to resist. The unit of resistance is Ohm. Typical values of resistors are in Kilos and Mega Ohms, but some low values are also there depending on the applications. A resistor can be treated as a safety component. As it limits the current. Besides the current limiting, a resistor is also used as the voltage divider. You do not need to buy many batteries for all different voltages. And no manufacturer design any value battery other than standard values. The best solution is resistor voltage dividers. I think this information is enough to have an idea of a resistor in basic. I have a dedicated post about it. I encourage to go through that post. Unfortunately, we do not have any pure voltage to work with. If we do have a pure voltage it means a lot of filters have done their job. Talking about filters means we are pointing towards the next basic component, the capacitor. You may have heard of the capacitor as charge storing device which is true. But as basic electronics learner, I think you should treat capacitor as a filter, which filters out impurities from a signal. As a storing device, you can charge a capacitor and use it as a voltage source for some time i.e. a delay provider. It is very cool to see LED blinking for some time. Of course, you can do it by doing some coding but it is the beauty of a capacitor that can make an LED to blink. A capacitor is rated in terms of capacitance (C), the ability to store charges. The unit of capacitance is Farad (F). Typical values of capacitance are in micro or pico Farads, but you have big capacitances as well. Besides the unit, there are two types of capacitor, the ceramic and electrolytic. An electrolytic is polarity dependent capacitor while the ceramic is independent of any polarity. The capacitor is a base for resonator circuits, voltage doubler, buck and boost converters. These are very advance terms but I know you will learn them one day. You will find a lot of valuable information on capacitor online. 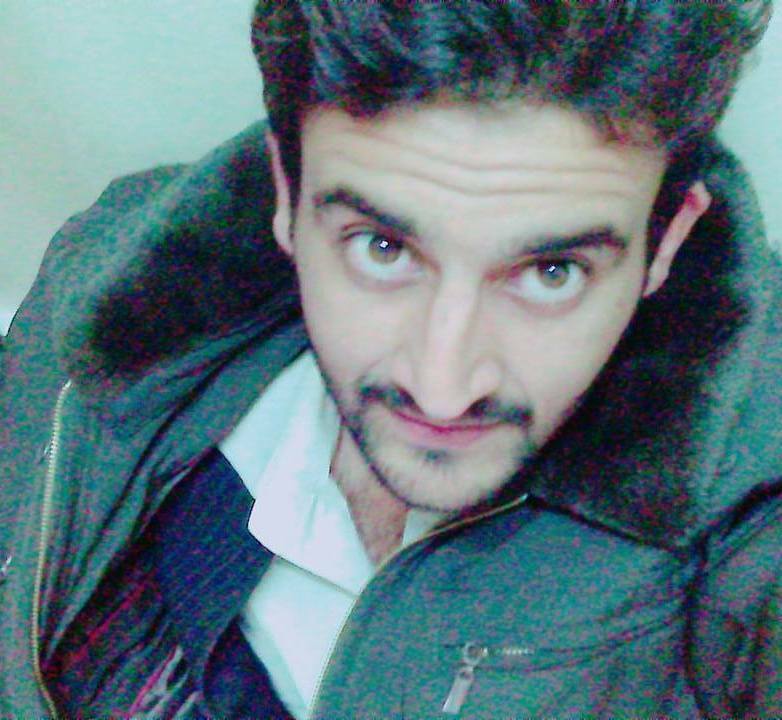 I am focused on its use in circuits and its behavior when a certain voltage signal is applied across it. It acts as an open circuit for DC voltage and acts as a short circuit for AC voltage. Acting as an open circuit for DC makes it an ideal decoupling component in amplifier circuits. DC voltage is applied to a capacitor for charging purposes. To know in detail about the capacitor check out my this post. This is the component which I did not use a lot in my projects. The reason it is very bulky in size. And I always avoid to use it in my circuits due to its size and making process. In my experience, every time I have to use it in my circuit. I have to make it myself. And I did not enjoy making it for unknown reasons. Moving on, Inductor is primarily used as a filter for the specific range of frequencies. In terms of input voltages applied to it. An inductor acts short to DC voltage and open to AC voltage. Which is very interesting to know about it. This property is totally the opposite of a capacitor. I personally do not know much about it but the main applications are tuning circuits. You can tune to different frequencies by changing its inductance. We usually avoid it and consider capacitor as the better choice. Because it is easy to vary capacitance rather than inductance. An inductor is rated in terms of inductance, the ability to store energy. The unit of measuring inductance is Henry (H). Typical values of inductance are in Milli Henry but some small inductances are also available. Other than filtering, an inductor is used for sensing purpose. Inductors have the ability to detect the presence of any magnetic fields near to it and convert it into a voltage by using the principle of mutual inductions. Interestedly, if you open any motor you will see the bunch of coils. They are actually acting like inductors. Trust me if this little device was not invented in Bell Labs, we would have no modern world. This advanced technological era is only possible because of a transistor. Enough talk. I have a separate post on it. Here, let me try to explain it in simple words for beginners. A transistor is an electronic device which amplifies weak signals. For example, the loudspeaker which amplifies sounds enough to break the windows glass. Actually, working of a transistor is very much complicated. There are three main modes of it, active, saturation and cut off mode. So, I said it amplifies weak signal which means I am basically trying to tell you about the active region property. But when I am saying it can be used as an electronic switch I am trying to deliver the remaining modes information. Yeah sounds tricky, but you have to go with it. Transistor was the hardest one for me to learn. I can not blame you if nothing made any sense for you thus far. There are different types of transistor out there, Bipolar junction transistors (BJTs), MOSFETs, IGBTs, FETs, designed for special operations. The one which I think best for beginners is bipolar junction transistors. It is simple to understand and is very basic. BJTs themselves further divided into two, NPN and PNP. The most used is NPN. Alright, this is enough to just have an idea. You have to put time and effort to learn everything about this coll component called the transistor. Along the journey of learning basic electronics, you will find almost every circuit will have this basic component. So, my advice is, give it a special attention. You are home, office or anywhere you have played with switches, just turning them on and off for no reason. If you did not do it yet. I am sorry but you just missed a lot of fun. I do not know why I enjoy it so much to turn switches on and off for no reason. Similarly, a diode is no more different these switches except diodes are small and digital switches, which you can not turn on off with hands. Power supply circuit is possible due to these tiny diodes. They are arranged in such a way that the AC signal gets converted into DC. The beauty of these devices is the low power consumptions. Basically, diode works in two modes, forward and reverse bias mode. To make diode on, forward bias mode, apply a positive voltage to the anode terminal and negative to the cathode. To make it off, reverse bias mode, reverse the polarities i.e apply positive voltage to the cathode and negative voltage to the node. This is just the introduction, to know more about it in detail go to my this post. There are many types of diodes out there, Zenor, and Schottky diodes. Zenor diode is best used for voltage regulation while the later one is preferred for fast switching. The working principle of all types are the same, they are designed for special applications. Your first project would be playing around with LEDs when learning beginner basic electronics. I just can not explain how much joy it would be to see these colorful devices in your project. These colorful devices, LEDs, are the special type of diodes which give light in the forward bias mode. Personally, I used to include many colors LEDs in my beginner projects. They are amazing and the best part about these is, they are very inexpensive. LEDs are mostly used for indication purposes. The best example is your laptop which maybe you are using now. See the power indicator light. It is an led. The most important thing I forgot at the beginning is, the word led stands for a light emitting diode. Next time you see an indicator, probably it would be led. Just like the simple diode, it has anode and cathode terminals. Usually, the long terminal is an anode which means you have to connect it to the positive terminal of a voltage source. LEDs are low power devices. Typically, they are 5 to 30mA. A series resistor is always needed to prevent it from burning. Sometime you will need to control a big machine with a small voltage. For example, to control 220V with just 5V. It sounds crazy, but actually, it is possible by using relays. A cool project would be like to control your room light from your android mobile. Think, your room light need 120/220V volts to turn on. How a mobile signal can turn it on. It is possible because of the relay and Arduino Board. Relay plays a key role in safety. When high voltage terminals attach together there comes some spark. This spark is dangerous and can be eliminated using a relay. if you thinking how then wait I will make a complete post on it. For now, just focus on basics. Relays are almost everywhere. You open UPS, you will see relay is working there, switching the mains and battery powers when needed. Looking at the relay symbol, there are five terminals. The low voltage side has the terminals where a low voltage, 5V, is applied. The other side has three terminals, normally open (NO), normally closed (NC), and the common (C). Upon application of low voltage, the coil gets energized and switches the NC to NO, or vise versa. I guess you all know what is a switch. It is a device using which you control the flow of electric current, in a simple word to turn something ON/OFF. For example, you have a battery, connecting wires and bulb. There are two ways you can make a torch from these. Directly connect the bulb to the battery using connecting wires. Or the second way is to make the same circuit but put a switch in between the bulb and battery. Solder connecting wires to the battery permanently, you no more need to use your hands. Enjoy turning on or off the bulb whenever you want by a switch. It is a device using which we can turn ON/OFF any device. Switches came in various types. Each type has its unique applications. But the main purpose remains the same, i.e. to turn something on or off. Sometimes a signal switch upon trow turns on a signal device, called the single throw single pole (STSP) switch. There may be double throw double pole (DTDP), or double throw single pole (DTSP), and the list goes on. You got zero power loss across a closed switch. This is so cool, you have ideally zero power loss in switches. Now you will be amazed to know, an open switch acts as an open circuit. Which means there can be, theoretically, any voltage across it but no current can flow through it. In conclusion, theoretically, a switch has zero power loss. But this is not possible in reality and there are some parameters which you have to keep in mind while selecting the best switch for your design. As a beginner, these parameters are of no use to you. You will learn them as you invest time in learning basic electronics. Integrated circuits are complete circuits implemented on a small silicon chip. I am finding it very hard to put it in simple words. But let me try my best. They are complete circuits which you can use as part of your circuit to get a job done. For example, Intel processor is itself complete integrated circuit, usually called the chip, but it is embedded with other circuitry to make a working computer. By itself, the integrated circuit may be of no use but when combined with the external circuit you make very cool and fun basic electronics projects. 555 is the most popular IC for beginners. It is used in many awesome and useful projects. The IC itself is just a black box which can not perform anything without the external circuit. But once you place it right in your project you can have cool results. The best example is flashing led circuits. By using 555 you can make led to blink which is very cool to see and motivational if you are a beginner. The circuit which I shared with you earlier, in connecting wires section, is actually flashing led circuit. And this was my first time to use 555 IC in my project. I can not say it was my first time, but I can say it was the first time to use in the right way, and successfully made led to blink. Most of the circuits you will encounter on your journey will have ICs. They make the circuit more professional, small, and economical. Let me tell you something. The first time I used the IC (555 timers), I was not aware of what is inside of it. Later on, I found there is too much complex circuit inside of it. Which if begin to learn as a beginner, I am sure electronics would not be that interesting to me anymore. With time you will learn how to design an IC, if you are interested, and can have a career in IC designing. Other than the above components, I personally think, a beginner should have basic knowledge of cool open source hardware. You can play around with Arduino or raspberry pi. Electronics is somewhere related to coding. Coding a microprocessor is fundamental to electronics. I do not want you to code for NASA but at least a little bit of code you must have in your mind. Every field has its fundamental tools. They make the job easy and fun. Same goes for electronics. It has its own tools which are very cool and fun to play with. The best part is they are too expensive. I do not know how to write about them. But let me try my best. It is the most fundamental tool you will need to actually implement basic electronics circuits. This is the board where you will make the prototype circuit. Let me explain the prototype a little bit. It is the circuit which is implemented for testing purpose only on breadboards. Breadboards is very useful for connecting various basic electronics component to make a complete circuit. For example, you came up with a cool idea. To perfect this idea you need to test it. Make different circuits for it. And after several iterations, your idea may go for manufacturing. In simple, a prototype is the exact same circuit which you want to manufacture but is not in a very beautiful and well-designed form. It has some nice rows and columns. I am sure you will have a great fun playing with it. I will write a post on how to use it properly. But now I just want to have a basic idea of what it looks like. The name is self-explanatory. Of-course you need some wires to connect components together. If you do not connect components, you are not making a complete circuit. Which means nothing would work and you will end in failure. There are various types of connecting wires. Two are most common, male and female. In my junior years, I was not a big fan of male and female wires. I used to play around with normal connecting wires, the one shown after the example in the above picture. The reason was, male and female wires are of fixed length and I did not want my circuits to look like as shown in the example (above picture). The beauty of normal/jumper wires was I could cut them according to my requirement. Let me show you one of my first circuits. Wow, it still looks so good. It has made me emotional. I am remembering a lot of good memories by now. Coming to the point. I am just saying, normal wires make a circuit look decent. But the problem is once you cut them for one project. There is a very low chance they can be used for another project. This board is used for mastering soldering skills, in my opinion. I personally used it only for this purpose. This is a very confusing board in the beginning but becomes fine after playing with it. I do not like it. As there is always a good chance of burning components in the soldering process when you are a beginner. It has got two basic types, open and shorted. Open is easy to play with as compared to the short one. The one showing in the above picture is an open type. You would have fun soldering. But be careful not to burn any component by putting solder for a long time on it. 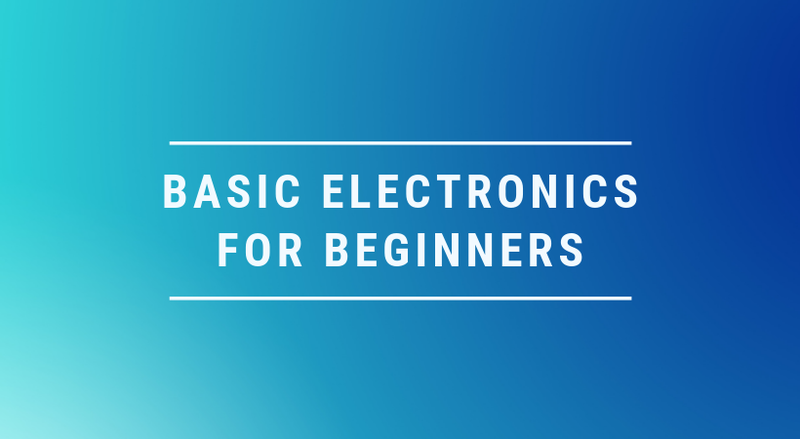 So far we spent enough time learning about components in basic electronics for beginners. I hope you gave them the time they required. It is now perfect to talk about circuit schematic. Every component has to be connected in some way to make a complete circuit for a purpose. To do that we need special drawings to make the design process easy to understand and implement. I mentioned the battery, wires and bulb circuit before. It is a very basic one and easy to understand. All you have to do is just connect the bulb to the battery by connecting wires. To interpret this circuit visually, a schematic is a good solution. Following is the schematic for said circuit. You see, the circuit schematic makes it easy and simple. I can understand if I close the switch the bulb will glow, and if I open the switch the bulb will turn off. Schematic is very important in electronics. It tells you what terminal of a component should be placed to the next component, or what component must place where in the whole circuit. Let me put the whole thing in simple words. A circuit schematic is guiding diagram which you follow to make a circuit work fine. How can I ignore the importance of a good software for beginners? It is the only place where you try your every idea and yet be safe. There are many simulation software out there, like Proteus, Pspice, and Multisim. The one which I like personally is Multisim. It is up to you which simulation software you like and want to go it. My recommendation is to try everyone and then select only one and go with it till the end. The reason I said you should try all because each one has its limitations. And with time you will get to each limitation, so it is good if one software fails you have an idea the next can do it. The first thing in making any circuit is, to know the problem statement. Of-course if you do not know the problem how can you find a solution to it. Big mistake basic electronics beginners make, in my opinion, they just try to copy and paste circuit. They copy circuit online and try to understand it, like me when I was a beginner. It is good but not the best way to follow. Personally, I think, one should start with a problem in mind. Then search for its solution, try to present his own solutions. I am sure you will find the solution very soon. The solution will definitely be a circuit. You got the circuit, but this is not just a circuit you are trying to copy. It is the solution to your problem. The next thing I want to share is, try to design every thing in the circuit. In the beginning, you might not come with your own circuit but if you are following already made circuit. Then it is good to know why each component is used and how the values were calculated for it. Enough talk. Let’s do an example. This is very simple and I already share it with you. Yeah, of course, it is the battery, bulb, switch and connecting wires example. But let’s try to solve it from a different angle. You love reading books. You are living in a hostel where you have to share your room with other students. Suppose, you love reading for late and the room’s main light bothers your other mates. This may not be the best scenario, but this is what I am imagining right now. You really need a lamp. Unluckily, the lamps are out of stocks. Now, this is the problem and you have to use your brain to find the solution. I know you will Google it to see if any relevant work is done. This is a good approach. But let me add something here. Before Google just give it a try to think of your own solution to it. You will find it amazing when you Google it after thinking about it for a while, as there is a good chance you will find exactly what you thought. Continuing our scenario of hostel room light problem. You are thinking. How can I solve this problem? Somehow you get the idea, and you will get it, that you need a power source, an led, a switch, and some connecting wires. You draw a diagram for it from your imagination. It would be awesome if you share your diagram in the comment section. I would love to see it. Do not worry if you did it wrong. Now to test your own diagram, software is a perfect place to go with. Try to simulate it in your software and see the results. If you get the right results, time to buy components and implement the circuit on a breadboard. If the results are still valid on the breadboard, make a beautiful case for it. And congrats you just present a perfect solution to the problem. Above was my feelings to share with basic electronics beginner, learner, or hobbyist. I feel if you follow the above steps in your journey you will be fine and have fun in electronics. In this section, I want to take you through the actual design process. The design process is hard but once you learn all the rules and get experience it will not be hard anymore. The next thing is the value of the resistor. What should be the value of the resistor? How much power rating it should have? How much current and voltage the led want to glow perfect? What should be the value of the battery source? These are the questions which you should answer when designing any circuit. These question will get complex as you deal with more complex circuits. To calculate the value of the resistor we need to know what exact current will pass through it. And to find this exact value we need to check the datasheet of LED. Because the function of this series resistor is to prevent led drawing more current than its requirement (given in the datasheet), in a simple to prevent it from burning. I think it is a very dry presentation. But this is what I really want you to follow. It is easy to have a ready made circuit but it is always fun to design a one with own effort and thinking. Look, in real circuits, you need to measure voltages, currents, resistances, capacitance, and the list goes on. To measure mentioned, you need some measuring instruments. For example, in the example above, we used the resistor of value 332Ohm. How in real life you gonna identify it. There would be a bunch of resistors in your lab. The answer is using a multimeter. There are a lot of useful instruments in electronics, but the following are the very basic. You must have it, atleast the multimeter. The rest is a little costly, but a multimeter is not that too expensive. It is a device which you can use to measure, voltages (AC and DC both), current, resistance, continuity and capacitance. I do not think something else you can measure with it. I remember you can also verify the transistor pin with it too, but who cares for this extra feature. A multimeter is the first instrument I encountered on my first day in engineering university. It is very cool to play with this. I will make a post on its usage. But somehow I feel the internet is full of everything, people have already done in a perfect way. Let me know in the comment what has actually left from all these people. I will try to cover it. Meanwhile, if you want to buy a decent multimeter for self, you can check my recommended best multimeters for beginners in the post. The multimeter has its limitations. You can not measure everything with it, especially when the signal is continuously changing. Sometimes it is also required to see the signals to predict their behaviors. 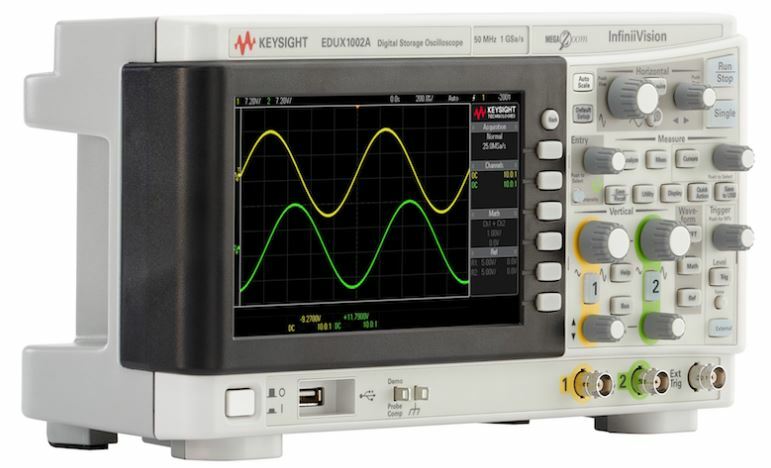 For all these measurements, an oscilloscope is the only and best choice we have. It helps us to see the actual signal on its display screen. For example, an AC signal can be seen and measured more accurately on oscilloscope then multimeter. There are two types of an oscilloscope, analog and digital. The one which presently dominates the industry is digital. Of-course who cares for analog when you have modern digital one. To know more about this device and want to have one for you, checkout my this post. How could you be the beginner, hobbyist or DIYers of basic electronics if you do not practice soldering your projects on veroboard or PCB boards? Well, to do this obviously you need a good iron solder. Be careful when playing with iron solder. A silly mistake may damage your components, but also my harm you as well. You may not need as a beginner but it is good to learn about it as you will definitely need it in near future. Some circuit you design will have an input of square, ramp or even impulse. Your circuit may not always have DC as input. Other possible can be your input signal. To generate those signal, a function generator is the better option. It is very fun to generate a signal on function generator and see them on an oscilloscope. You will learn a lot from that. You will learn how frequency affects the reading and shape of a signal. How the frequency of a signal can be measured and verified. Every field has its own beauty, culture, and workspace. For example, doctors have their clinks, white dress and the stethoscope around their neck. Similarly for electronics hobbyists, engineer or beginner there is a very special place, called the lab, which is full of beautiful stuff. You got you a multimeter, oscilloscope, function generator, resistor kits, electronics toolkits, capacitor kits, and the list goes on. Wish I could have the lab like this one. Presently, I am doing my Masters. My previous lab was at my last university, now as I shifted to a new university and hostel, I do not have any proper lab setup here. I just have little tools which I can place on room disk and not bother my roommate by trying crazy things I used to do in my previous lab. The most important thing is, please organize everything in your lab. Do not show any laziness in this. You will regret it as your lab goes on increasing. Take care of your lab very much. This can be the place where you will work to earn for yourself and your family. So respect it. This is all that I want to share about basic electronics for beginners, hobbyists or DIYers. Hope this long piece of article has helped you in some way. As I told you, it needs time and passion to excel in any field, and the same goes for learning electronics. In the beginning, it would be hard but do not lose faith. Never give up. Hopefully, you will get succeed. Thank you and have a good life. If you have any question, comment below without any hesitation. If you like this article, don’t forget to share it your friends and family.